The Peacock has laid an egg or hatched some creative magic. Depending upon your point of view…. is staying at NBC, and he’s moving to prime time. The network announced Tuesday that Leno will host a show five nights a week at 10 p.m. Eastern, after he leaves the “Tonight” show next year. The network had announced nearly five years ago that Conan O’Brien would move to “Tonight” and succeed Leno. The deal not only prevents Leno from moving to another network and competing with O’Brien, it also has the potential to be a big cost savings for NBC. A talk show is considerably cheaper to produce than the dramas that usually air at 10 p.m. Eastern. 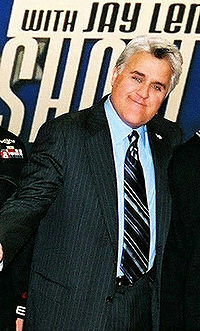 Leno could now deliver his nightly monologue and sketches to more viewers. Generally about 50 percent more people are watching TV at 10 p.m. than at 11:30 p.m. Yet dramas have been fading in recent years. One reason is digital video recorders; more people are watching shows they taped earlier than the live 10 p.m. shows. Ten years ago, “ER” was the top-rated show in television, with an average of 25.4 million viewers. This season, its last, “ER” is averaging 9.9 million viewers and is ranked No. 33 in prime time. Besides “ER,” NBC this season airs “Law & Order” and its “Law & Order: Special Victims Unit” spinoff in the 10 p.m. time slot — both shows that could easily move to an earlier hour. “My Own Worst Enemy” and “Lipstick Jungle,” shows in the 10 p.m. hour on Monday and Friday, have already been canceled. NBC had said last summer that Leno’s last “Tonight” show would be on Friday, May 29, and that O’Brien would take over the following Monday, June 1. Jimmy Fallon is taking over the 12:30 a.m. time slot that O’Brien is vacating. You are currently browsing the archives for the peacock category.